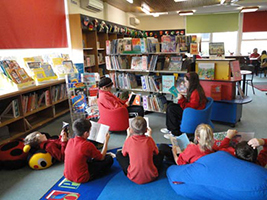 Torrens Primary School Library, staffed by a specialist librarian, is central to the school’s teaching and learning program. It has a comprehensive collection of resources (print, multi-media and electronic) for students and teachers designed to match students' varied learning styles, abilities and interests. 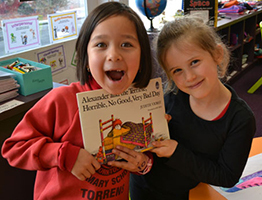 Its large non-fiction collection complements the School’s curriculum while its fiction collection, with its strong focus on quality literature, works to increase students' literacy skills. 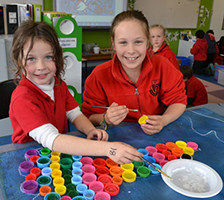 to provide a range of resources in varying formats to support students' recreational reading and inquiry-based learning, as well as teacher lesson delivery of the curriculum. When classes visit the library for a scheduled lesson with the teacher librarian, they participate in activities designed to promote appreciation of quality literature and development of information literacy skills. Literature appreciation is developed by sharing books by many different authors and illustrators, all aimed at exposing students to a diverse range of themes and cultures. This is achieved through activities such as listening to book readings, participating in book discussions, responding to literature creatively and undertaking author studies. evaluating or assessing the task. 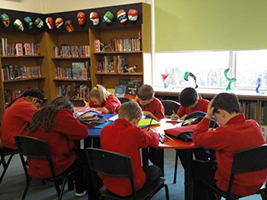 In addition to scheduled lessons, many students frequently visit the library to work independently on class work using the library’s independent research area. The library is open to students at lunch time on Monday, Tuesday and Thursday each week during Term. Apart from exchanging books and reading during this time, students are able to enjoy many other recreational facilities the library offers such as board games, interactive educational computer programs and supervised use of the Internet. Students may also use this time to complete homework or research information. Each year the library celebrates the Children’s Book Council of Australia’s Book Week. Special events are arranged such as author visits, literary performances, dress as a book character day and book based competitions. Other events the library encourages are the National Simultaneous Story-time and the Chief Minister’s Reading Challenge. The library also runs an annual Book Fair designed to further stimulate student’s desire to read.